Click Add from the top left corner of your screen and choose List. A window will pop up where you can enter the title for your task list. 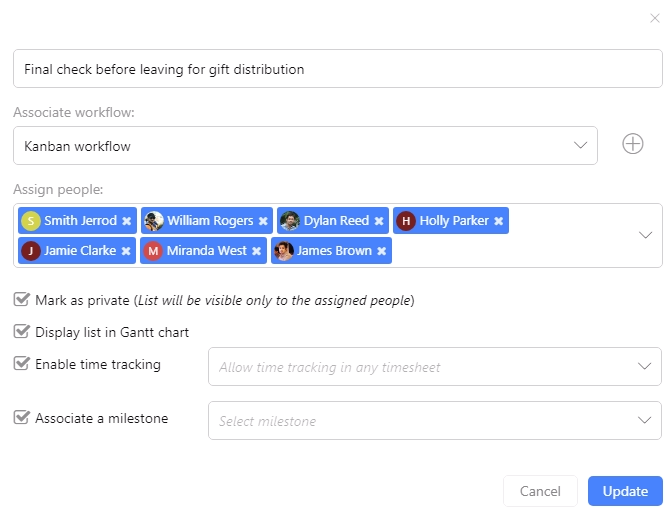 Select the type of workflow which you want to associate with your task list. If you want to keep this task list as private, then select the checkbox Mark as private. Select the checkbox Associate a milestone if you want to associate the task list with any milestone. Selecting the checkbox of Display list in gantt displays your task list in gantt section in form of task bars. By default, this checkbox is selected but if there is any task list which you do not want to view in gantt then you can always deselect this option. 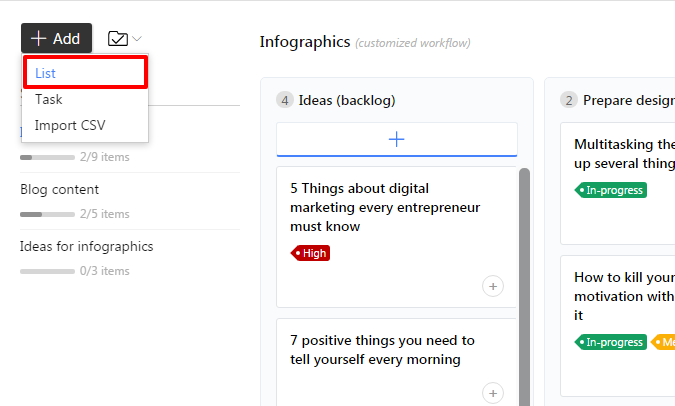 If you want to track the time spent on task list, then select the checkbox Enable time tracking and select any timesheet, which you want to associate with the list. The timesheet will automatically be selected whenever one logs their time entries on tasks under that task list. Assign people to the task list. You can assign the task list to the whole group at once. Hit Add and your task list will be added. There are two ways of adding tasks and assigning them to team members. Click Add from the top left corner of your screen and choose Task. A window will pop up where you can enter the task details. Select label that you would like to assign to your task. You can manage labels from label filter itself. Click the dropdown menu besides labels and choose Manage label from bottom. A window will pop up from where you can add new labels. You can also edit or delete existing labels. Assign people to your task. You can assign any task to the whole group at once. Add a start and due date to your task. Select the checkbox Estimated hrs to enter estimated hours to your task while assigning it. If you want to add another task, then select the checkbox Add another task and enter the details, just like you did for first one. You can attach files from your system by clicking on the attachment icon, you can also attach files from other projects in ProofHub, or from third party applications like GDrive, Dropbox, Box and OneDrive by clicking on their respective icons. Hit Add and your task will be added. Enter the task in the text field. Add due date to your task by clicking on date picker. Click Assign people icon and a window will pop up from where you can select people whom you want to assign task and click Add. Labels can also be added to the tasks in a quick succession. Hit Enter and your task will be added. When you add tasks from quick bar with some due date and assign it to people, then that due date and assigned people will be saved. You can quickly add multiple tasks, which will be assigned to same users with same due date. You don’t need to enter same due date again and again. If you want to add a task with some other due date and assign it to different users, then click on Date picker and select some other due date for your tasks. Similarly, to assign tasks to different users click on Assign people icon, deselect the existing users and select new users from dropdown. There is one more way to quickly add tasks i.e. via Import from CSV files. For more details on how you can import tasks from CSV to ProofHub, Click here. Once you’re done adding tasks, your task window will be split into three. 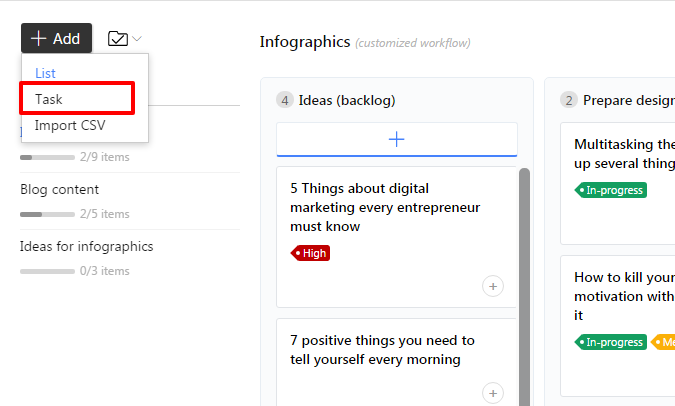 At the left of your page there will be all task lists, in the middle of your page there will be tasks, and at the right of your page you can see task detail panel from where you can add subtasks & comments to your tasks. If you do not want to see this panel, then you can always close it by clicking the menu icon from right and by choosing Close panel option. Select the task on which you want to add any comment. At the bottom right of your page, add your comment by selecting the text field of Write a comment. Hit Enter and your comment will be added.